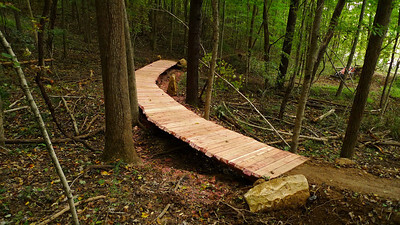 The first of many mountain bike trails around the Resort is now open. The trail is named Buffalo Trace due to the Buffalo Trace that ran through the property. It's a 6+ mile trail that climbs to the top of the West Side of Mt Airie. With more elevation than Hesitation Point, Alex Stewart built a trail with his signature flow. The tread is easy, and the grades are kept at 5%, so beginner riders will be at home. Advanced riders will finish the climb a bit faster. When they open up on the descent, they will find Alex's rewards for speed.